Monte and I were trying to figure out somewhere to go; we basically wanted to get dinner to celebrate the end of classes for this semester (and the start of finals time, I guess…)! Anyway, Dovetail was in the area and had reservations available, so we just decided to go here. It was a good choice! Monte: I never have a bad time at Dovetail. The food and ambience just puts me at ease, even with impending finals. Monte: Food descriptions, coming up! 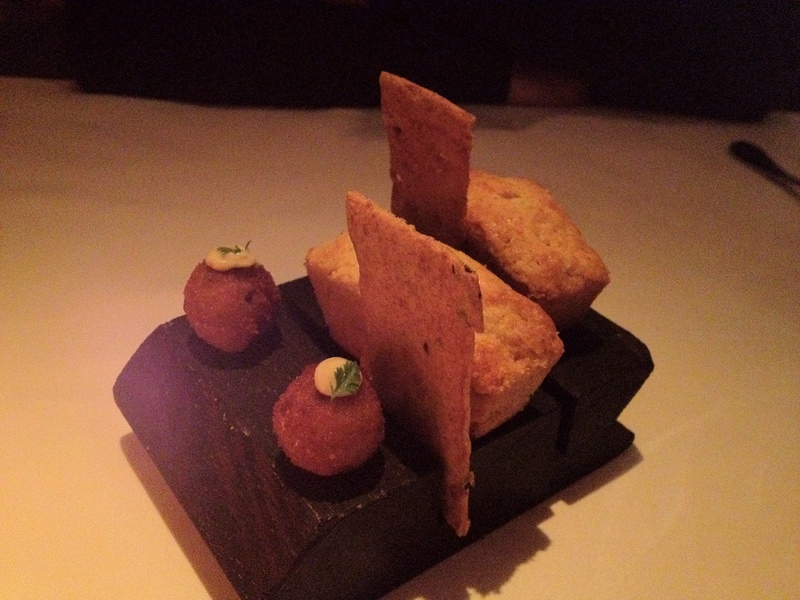 Truffle arancini, rosemary white cracker, and cornbread. Monte: I feel like the arancini, crackers, and cornbread never change. But except, this time, it did! The cracker tasted a lot crispier and thinner. It’s a good change. Rich fried truffle arancini and buttery cornbread were delicious as usual. 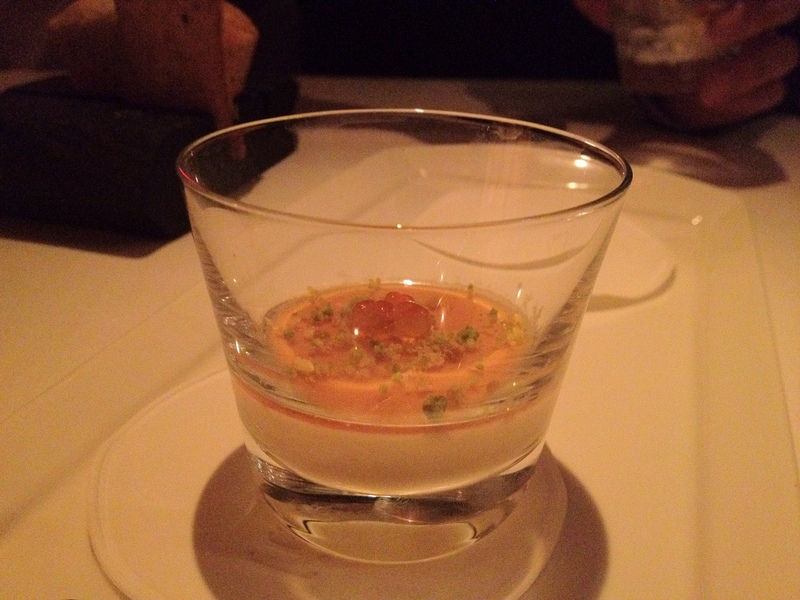 Apple panna cotta, salmon roe, and pistachio. Monte: Fresh, light, and creamy. It’s pretty complex with its myriad of flavors/textures, and I’m pretty sure a lot of the subtleties went over my head, but I like it! Squid noodles, apple, and daikon radish. 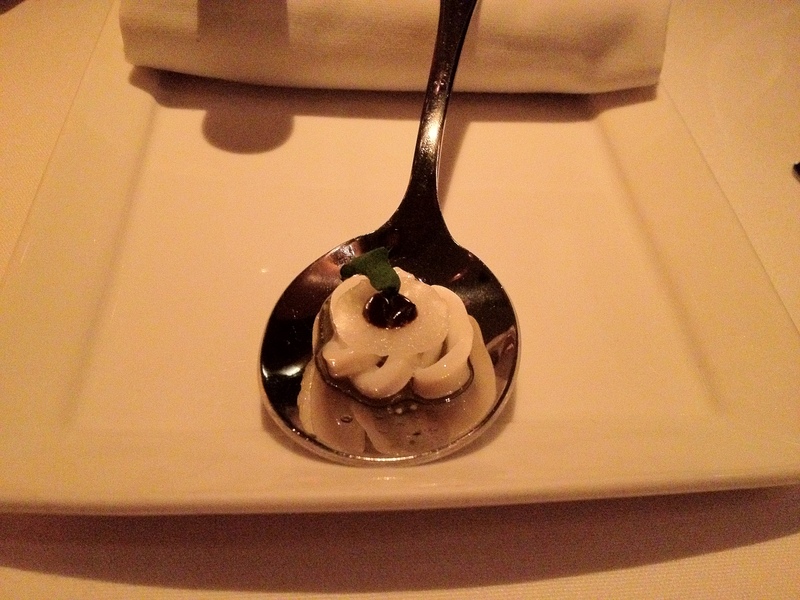 Monte: Unlike the first amuse where I thought the interplays between the crunchy creamy nutty sweet fruity tartness was all wonderful, this one went over my head without being that enjoyable. The squid noodles were tender enough, but I didn’t think the apple added anything. Salmon tartare, fennel, meyer lemon, and jalapeño. 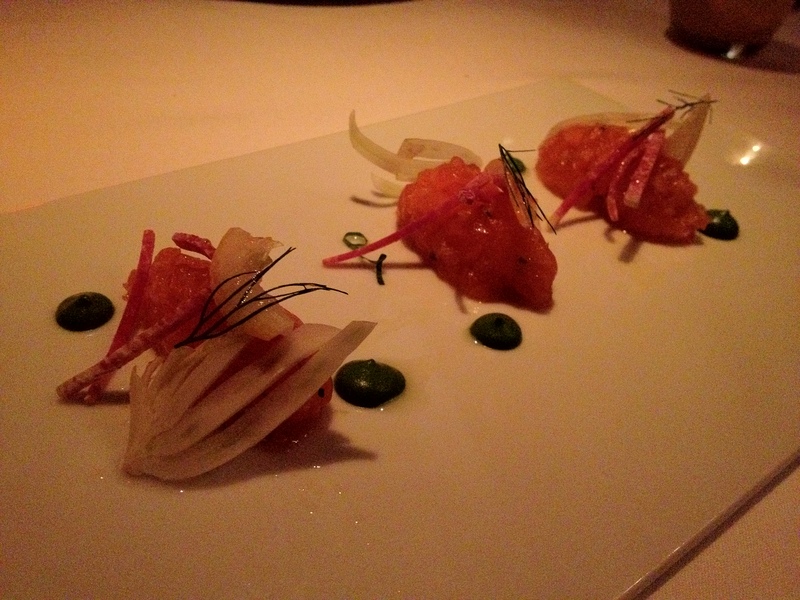 Monte: The tartar is wonderfully creamy and sweet-in the fresh yet aged cured salmon kind of way. The jalapeno added a nice spicy kick but I never once thought the dish was like a ceviche – it was its own unique style. 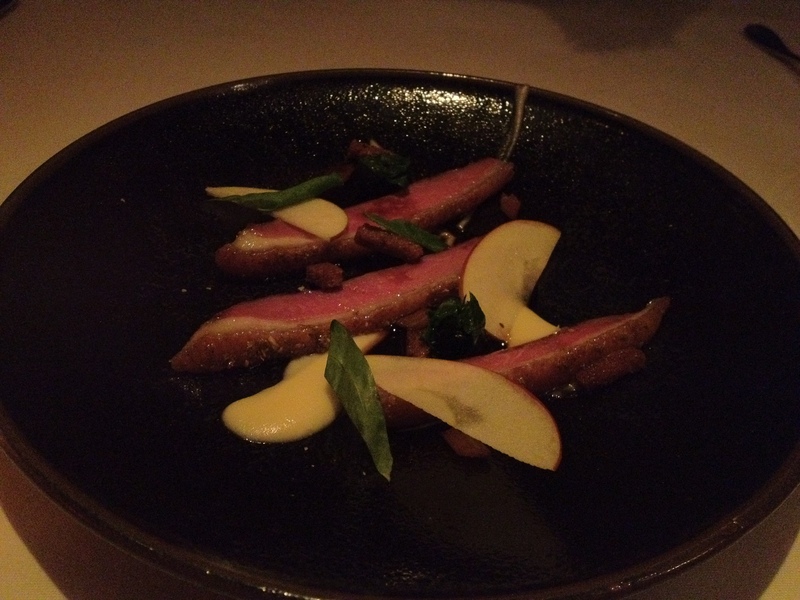 Crispy skin duck, apples, swiss chard, and rye. Monte: The duck skin was orgasmic. Crunchy skin, tender meat, and a sauce that must’ve been made by reducing the drippings like heck so that the flavors could concentrated intensely. Sunchokes, madras curry, cucumbers, and yogurt. 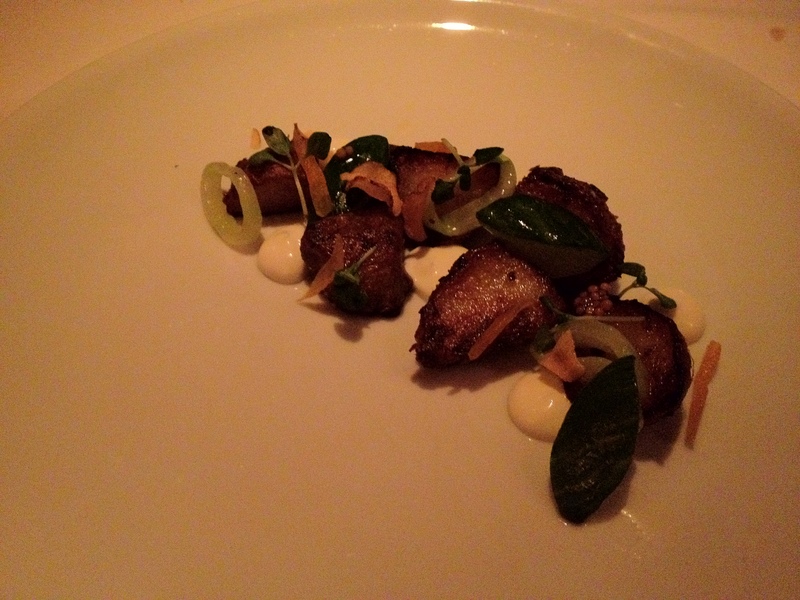 Monte: Sunchokes: roots that have the consistency of potatoes and the taste of artichoke hearts. They’re pretty interesting, but I love how Chef John added curry to it – the smokey spiciness is really great and not too common in new-american or french cooking. 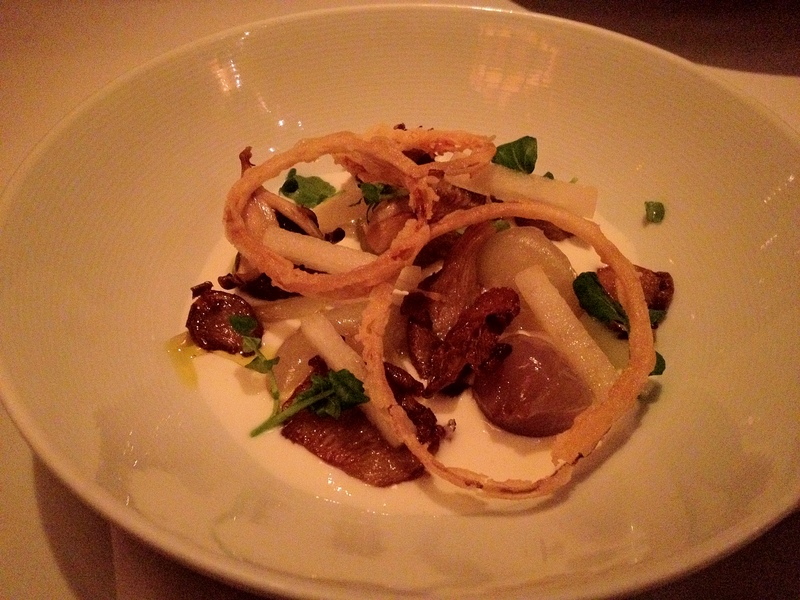 Salt-baked onions, wild mushrooms, and horseradish. Monte: I wonder if he saltbaked the onions like whole fish are saltbaked. Too bad I’m not a chef. 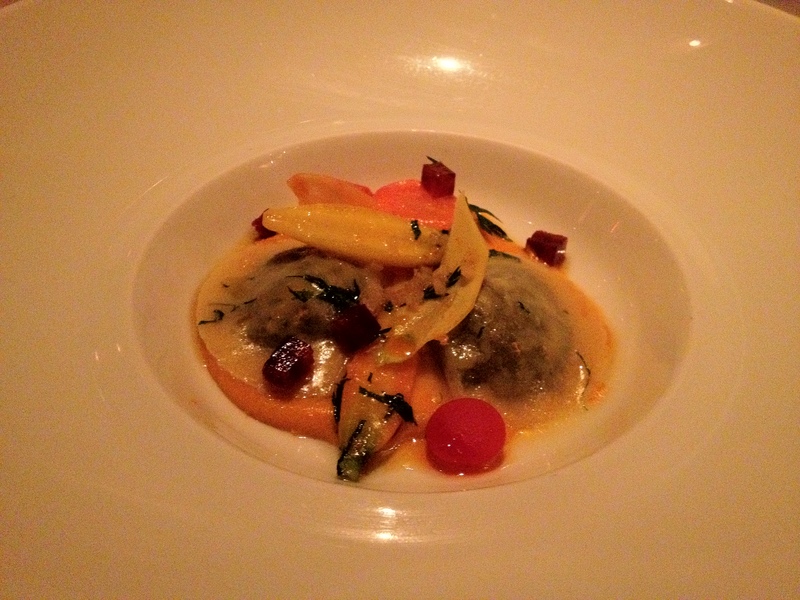 Foraged greens ravioli, carrots, chorizo, and preserved lemon. Monte: Wait is this dish on the menu? (Victor checks the menu and nods) I would totally order this as one of my pre-fixe choices, it’s so good. 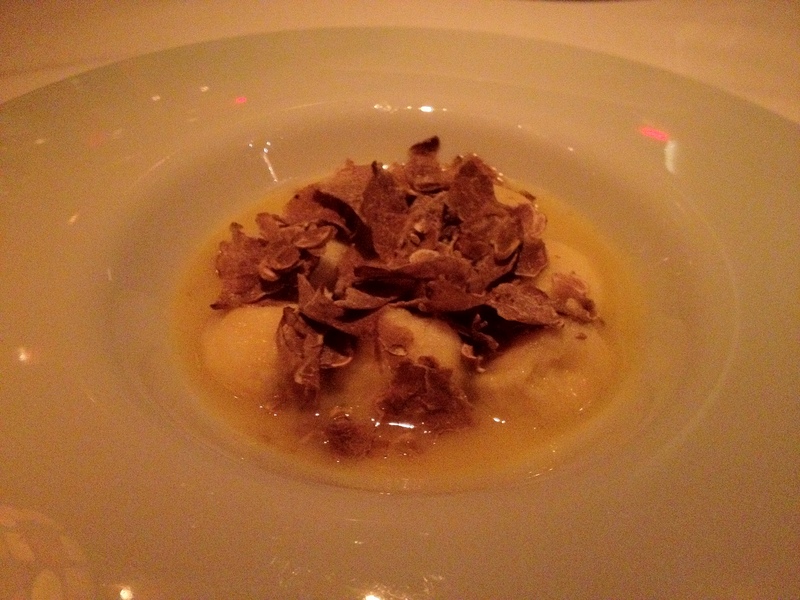 Ricotta gnudi with six grams of white Alba truffles. Monte: Ridiculous. Absolutely rich, buttery, truffley, and overwhelming with flavor, but yet not disgusting to eat in massive bitefuls because of the gnudi’s lightness. Sometimes, really rich buttery pastas can be quickly sickening due to the artery-clogging feeling that soon sets in; but this dish made me feel like I was getting all the aromas of truffle in air-form. The gnudi texture made me feel like I was eating almost nothing except flavor. 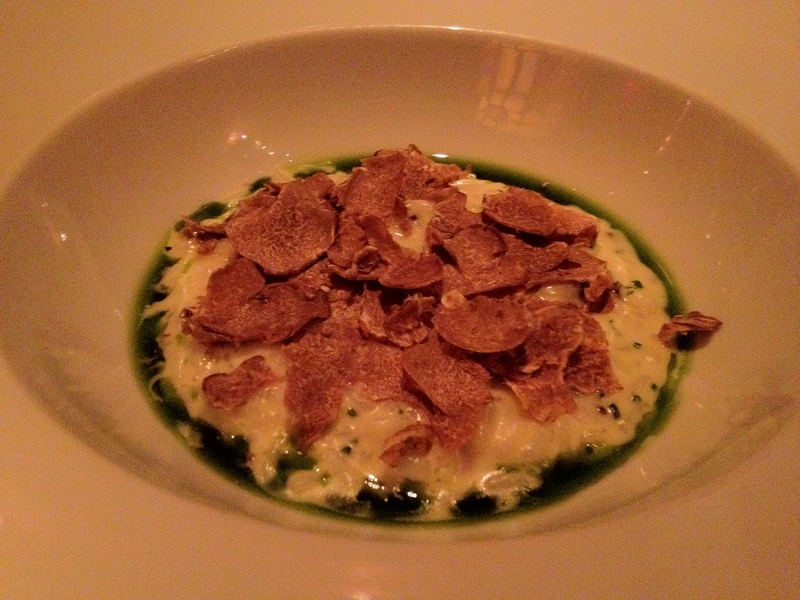 Parmesan risotto with six grams of white Alba truffles. Monte: Another homerun. The risotto was creamier and heavier than the gnudi, but still had a wonderful bite to it that contrasted well with the airiness of the gnudi. 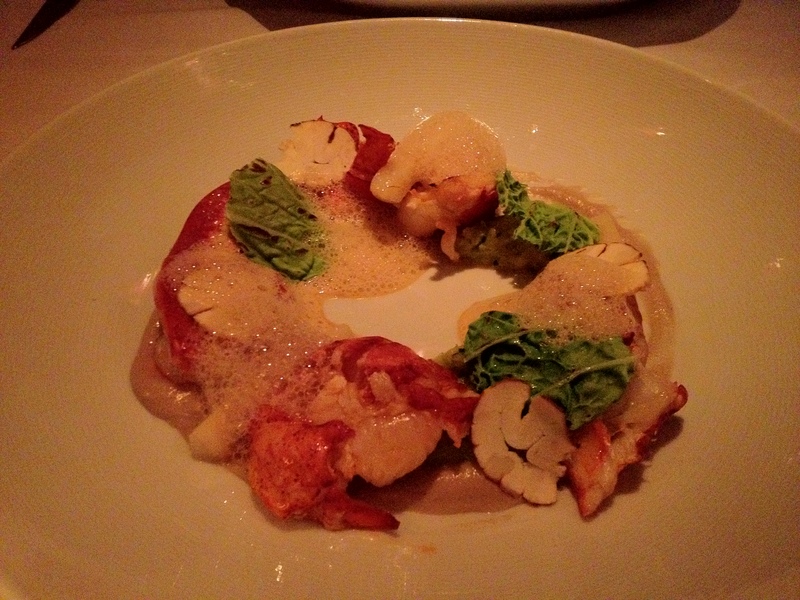 Grilled lobster, cabbage, parsley root, and chestnuts. Monte: The plating on this dish is awesome, I feel like I’m staring into a tidepool. Except I got to eat that tidepool, and it was delicious. The sweet juicy tender lobster paired really well with the side vegetables. 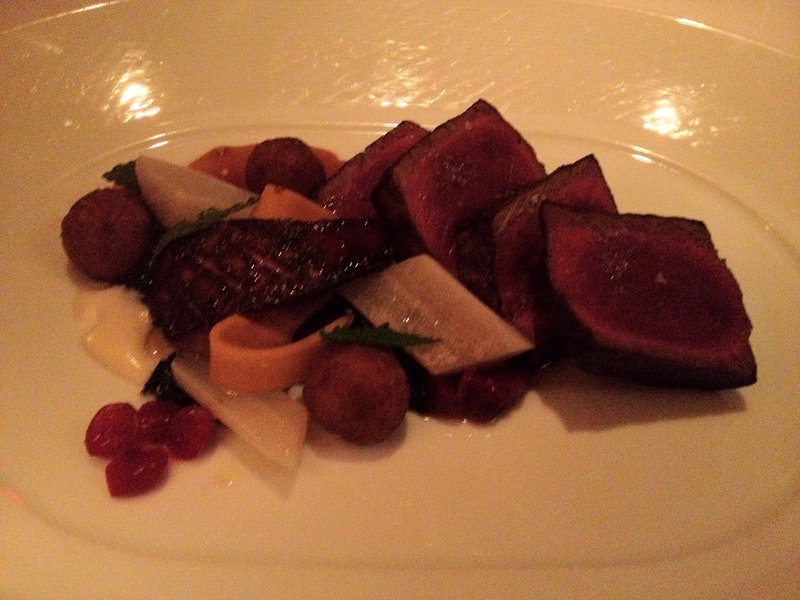 Venison, butternut squash, cranberries, and foie gras. Monte: Venison + foie + squash = rich autumn amazingness. The meat wasn’t too gamey (this one was less gamey than lamb, in my opinion), and I loved the pairing with the other ingredients. Cucumber granite with a Greek lime yogurt. 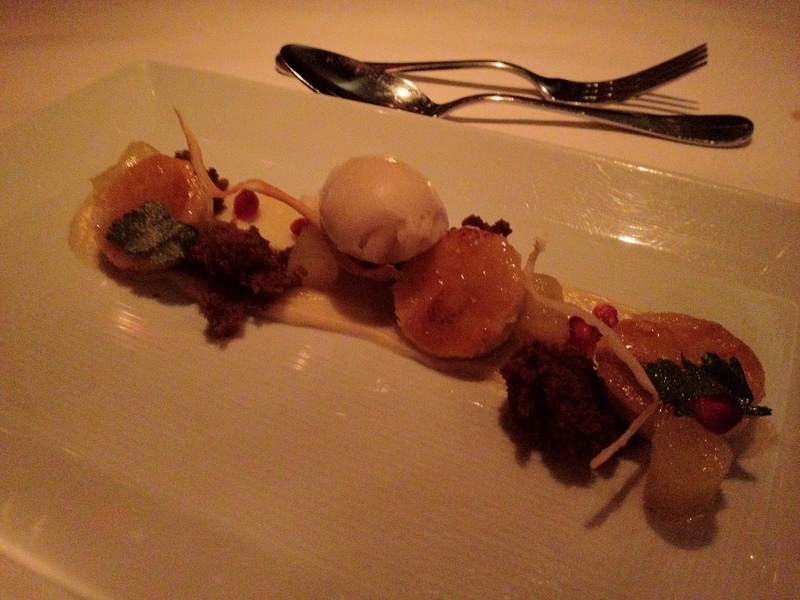 Maple crème brûlée, gingerbread, parsnip, and pear sorbet. Monte: I don’t know how they made the creme brulee. The sugar is clearly torched on top of the custard, but there’s no ramekin. How did they bake the custard and have it keep its shape outside of a ramekin? I wish I knew. 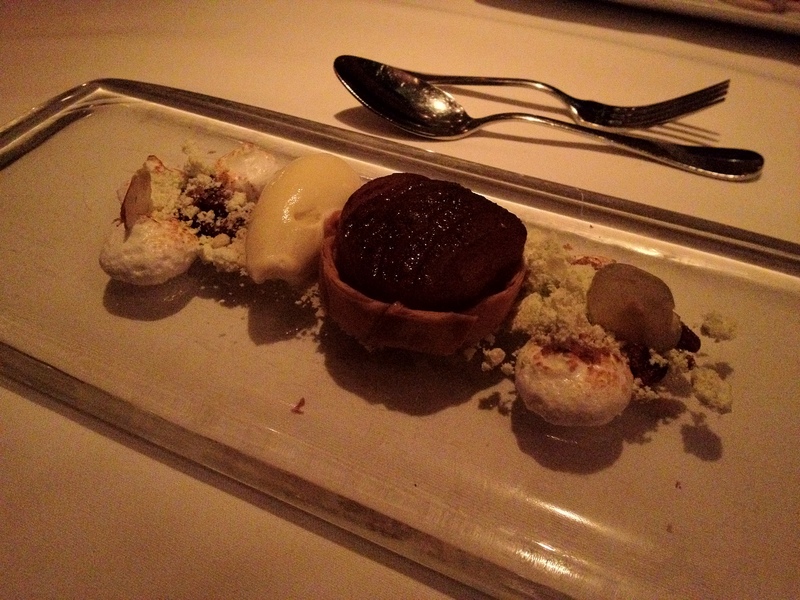 Apple confit tart, pecan frangipane, rosemary, and Calvados (an apple brandy) ice cream. 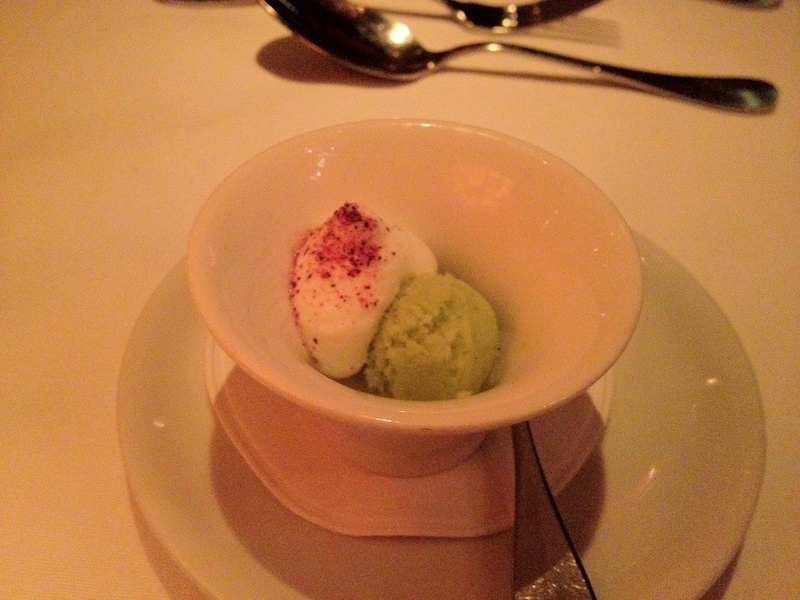 Monte: I thought this dessert was also amazing. The tart is super light, as if it was only a single layer of phyllo dough, yet it held up the apples inside. Truly delicious stuff. 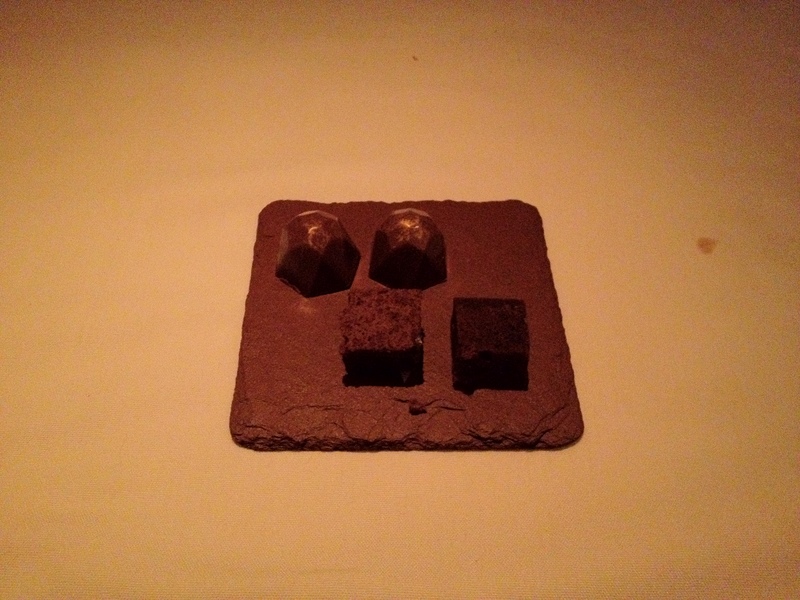 Monte: I only ate 1 brownie and 1 of the chocolates, and resisted eating Victor’s. It felt wasteful to leave them behind, but the amount of good food inside of me was already inducing me into a blissful food coma, I couldn’t handle any more. Thank you Chef John for a memorable meal.